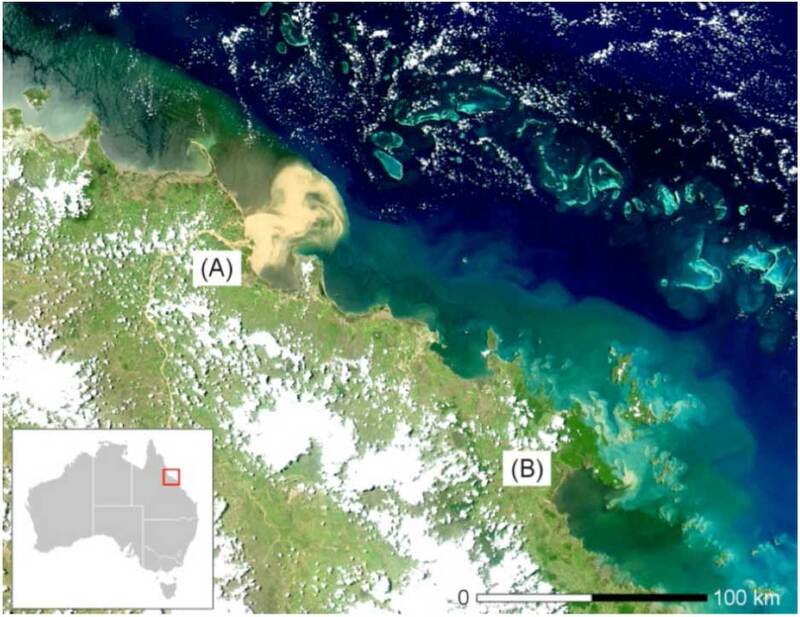 This project provided near real-time information of remotely sensed marine indicators to assist the Marine Park management to assess trends in ecosystem health, specifically to monitor the condition and trend of the Great Barrier Reef inshore water quality. The project collected and analysed near real-time satellite data of chlorophyll levels, suspended sediments, and dissolved organic matter. This data provided through the Dashboard can be displayed in different formats (map, table or chart) and downloaded for further analysis and interpretation. The system operates with daily satellite observations from MODIS-Aqua, in-situ observations for validation. More specifically, the Dashboard uses remotely sensed ocean-colour information from NASA’s Aqua satellite, which orbits the earth approximately every 100 minutes, carrying the MODIS remote-sensing instrument. MODIS is a sensor that measures the reflected sunlight from the earth’s surface in 36 spectral bands, of which nine are primarily used to sample ocean colour. The process is similar to digital photography, except that the sensor responds to a much broader spectrum than that of visible light. Each of the spectral bands captures the energy of the reflected light within the small window of a few nanometres (one billionth of a metre). The ocean-colour sensing bands are all within the visible and near-infrared sections of the electromagnetic spectrum. MODIS true-colour image illustrating the optical complexity of Great Barrier Reef coastal waters. Discharge of the Burdekin River (A) and the O’Connell and Proserpine Rivers (B). Credit: Schroeder et al. (2012, Marine Pollution Bulletin). The remotely sensed water quality indicators were derived from daily MODIS-Aqua observations by coupling of two physics-based inversion algorithms; one addressing the atmospheric correction and air-water interface, and one the in-water constituent retrieval. These methods were developed by the CSIRO and implemented into the Dashboard that is operated by the Australian Bureau of Meteorology. 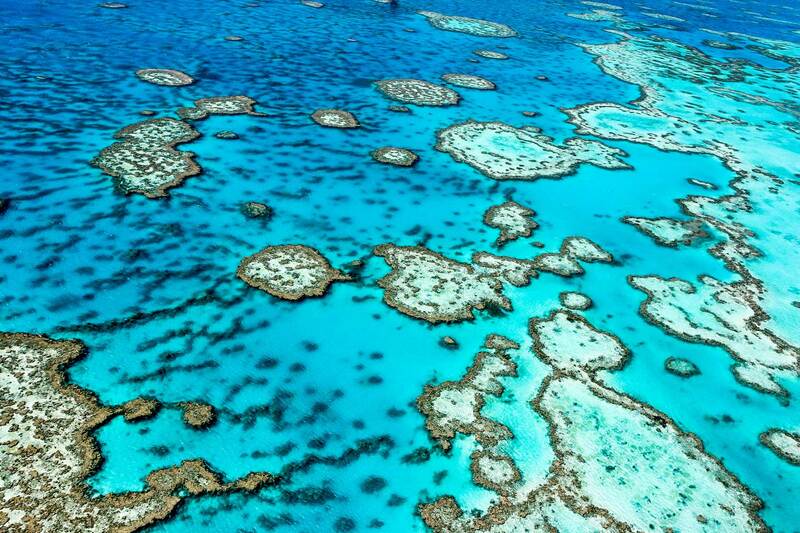 The Dashboard implemented methods lead to more accurate regionally-tuned water quality information provided for the Great Barrier Reef World Heritage Area. The policy and decision makers can use the data collected to improve the management of the Great Barrier Reef. Remotely-sensed water quality information of total suspended sediments and chlorophyll-a are used by the Marine Park Authority for compliance monitoring against guideline values and annual assessment summaries in form of Report Cards. Screenshot of the Marine Water Quality Dashboard operated by the Australian Bureau of Meteorology. 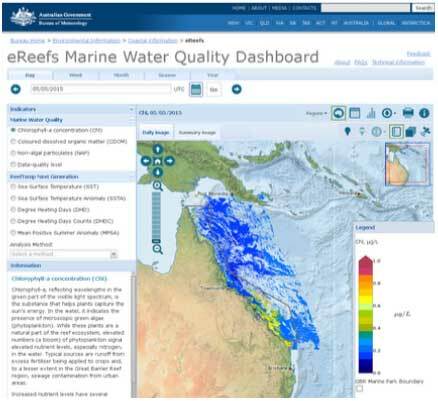 The dashboard provides near-real-time information of remotely-sensed water quality in the Great Barrier Reef using methods developed by the CSIRO.